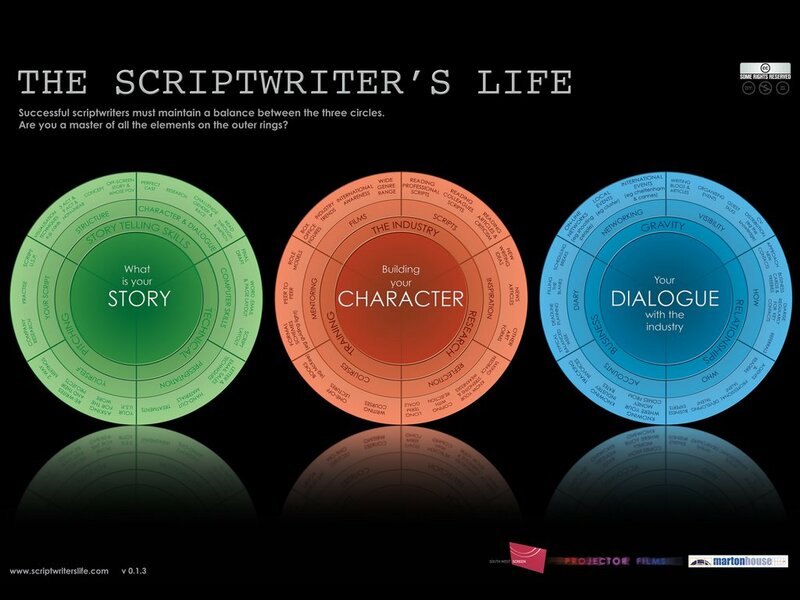 This is a new approach for Scriptwriters, like me, to think about what they need to do in order to be successful. 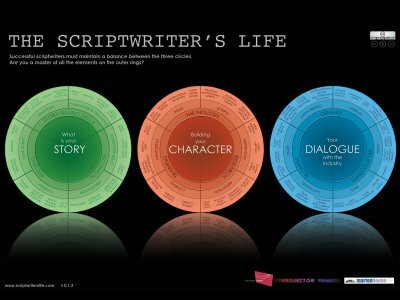 The diagram contains, all in one place, the life of a scriptwriter. Its a map that we can use to see what we need to tackle next. As far as I know no-one has done this before. Go to the site. Successful writers must maintain a balance between the three circles. What is your story? How do you pitch, how good is your story skills, are you on top of the technology? Building your character. Do you know the industry, are you getting regular training, do you know how to research? Your dialogue with the industry. Are you good at networking, are you drawing people towards you, are you keeping in touch often enough your key contacts? Tomorrow I'll fill you in on why I made it and how it came about. Smart attempt, and I particularly like the reflective nature of the base. It needs some explanation if these aren't to remain abstract terms. I can look at "perfect cast" and nod, but what does it mean - casting during the draft? You might know but without a presentation I may not. On the whole though I think this is helpful, such self generated free-format work can do with a standard practice model for those who aren't as disciplined as others. By the way you'd go down a storm at JP Morgan with visuals like that. I'll be picking apart some of the topics over the next few weeks on the blog. Especially the ones that are a bit hazy on the definition. Also I saw the Sundance success "Little Miss Sunshine" at HL a couple of days ago, top class. Steve Carrell should be in everything. I saw this film at Cannes. A strange film that mixes the beauty of imagination with harsh realities of the Spanish civil war. Its also the only time I've heard the Cannes audience applaud a special effect. I'll work on that. A B&W version will be up tomorrow. That is right on the money! Dialogue with the industry in particular is SO crucial - it's all very well whining about you can write a better movie or whatnot...You may be able to, but if you hang around in your bedroom doing it and hiding it under a mattress (the script that is - ooo er), then it's no good to anybody, least of all you. (You as in "one" here BTW). God what a garble. But know what I mean. Innit. Also - going back to where I possibly saw you before (this conversation being about 6 mths ago), were you in Resh's class?? And keep an eye for a special 'dialogue with the industry' section soon and we can thrash out some answers of how to do that together.